Our dramatic Chocolate Extravagance Tower makes a big impression! Features our 105 pc. Gold Ballotin, 36 pc. Biscuit Gift Box, 27 pc. Dark Chocolate Gift Box, 18 pc. Signature Chocolate Truffles Gift Box, 12 pc. Dark Chocolate Truffles Gift Box, 8 pc. Gold Ballotin, and 4 pc. Signature Chocolate Truffles Gift Box. 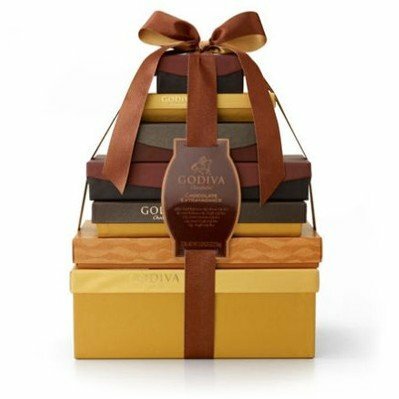 This gourmet gift tower is tied with our classic two-toned brown and gold ribbon. (5 lbs. 9.25 oz. ).